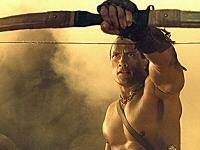 To be blunt, director Chuck Russell's 'The Scorpion King' is an awful movie. It may have nabbed $165 million during its worldwide theatrical release, but it still carries with it the stink of a poorly-conceived flop. It shouldn't for any reason register as anything more than bargain-bin clutter. With that being said -- sigh -- I have to admit I found myself chuckling, grinning, and even enjoying Dwayne "The Rock" Johnson's high-spirited performance in this otherwise forgettable, popcorn-fueled exploitation of 'The Mummy' franchise. Although I was a casual fan of 'The Mummy' when it was initially released, I despised the campier rehash of its plot in 'The Mummy Returns'. So when I sank down in my couch to watch 'The Scorpion King,' I realized I could barely remember how it was a part of the same, fictional universe. A few mouse-clicks later, I found my answer on an outrageous network of 'Mummy' fan sites. Apparently, the misguided sequel's demonic arachnid (the amateur-hour-CG creature that boasted a silly-putty mask of The Rock's face) was the cursed spirit of the Scorpion King, Mathayus. More to the point, the idea of a loosely-associated prequel clearly struck the film's producers as an easy way to make a buck. Your enjoyment of 'The Scorpion King' will likely come down to your affection for Johnson as an actor. Whether hosting "Saturday Night Live" or bickering with Christopher Walken in 'The Rundown,' Johnson elevates the most mundane material with a natural confidence that's been missing from the genre since the golden age of Stallone and Schwarzenegger. He even takes it one step further by bringing a warm, well-rounded charisma to a weakly written, one-note character. He inhabits Mathayus so completely that everything around him springs up and feels more alive -- a feat which instantly reminded me of Bruce Willis's breakout performance in the original 'Die Hard'. Even when the script delivers flat humor and bland scenarios, I got the sense Johnson knew the film was little more than big dumb fun. Pay careful attention when he adjusts and compensates for every blunder in the screenplay and you'll see exactly what I mean. He manages to invigorate the comedy, leap into the action with thrilling intensity, and deliver genuine emotions. Beyond The Rock? Everything else 'The Scorpion King' has to offer has been pulled directly from the straight-to-video handbook -- clumsy choreography, over-the-top bloodless violence, basement-theater acting, and poor CG effects. The sets might as well be made of cardboard, there are miscastings galore, the dialogue features distracting modernized diction, the love story is predictable and awkward, and Kelly Hu can't seem to figure out which movie set she stumbled onto. With all of that being said, I must admit that I don't think 'The Scorpion King' is a total waste of time. As it stands, fans of 'The Mummy' series will get a particular thrill out of its tongue-in-cheek adventures and over-hyped production values. Yes, it's a pile of junk that collapses under the weight of its own mediocrity... but give it a try. Unless you're yearning to catch the next Oscar hopeful, a scene or two with The Rock certainly makes it worth a rental. Released two years ago on HD DVD, 'The Scorpion King' finally arrives on Blu-ray (alongside the other 'Mummy' films) with an impressive 1080p/VC-1 transfer that makes the film's muddy DVD counterpart look like a relic of a bygone age. I honestly didn't notice any significant differences between Universal's 2006 HD DVD transfer and this new, 2008 BD re-release, but I imagine Blu-ray fans will be too pleased with the results to worry about screenshot comparisons. Shadows are deep and well delineated, contrast is spot on, and the palette boasts a spread of nighttime blues and firelight oranges that would send Michael Mann into a jealous rage. Better still, fine details are crisp, textures are amazingly three dimensional, and foreground objects pop. Want your jaw to drop? Look no further than the fire ant scene -- once you get past the awful CG renderings of the insects themselves, you'll notice individual grains of sand, thin twigs in the desert brush, and the slightest curl of rotting flesh on a peeling skull. 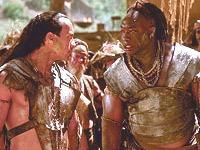 Then spend some time with the opening assault when Mathayus rescues his brother. Squint at the warm, flickering fire, take note of the minuscule stitching on the barbarian costumes, and count the pores along Johnson's nose. Finally, bask in the scene where Memnon spars with his own men. There's such a spectacular display of the transfer's contrast, color depth, and sharpness that the film's mind-numbing camp factor is momentarily forgotten. Unfortunately, there are still a few dirty corners in 'The Scorpion King's visual paradise, most of which can be attributed to the film rather than its technical transfer. I've mentioned the mind-numbing CG in almost every paragraph so far, but the crystal clear presentation really exposes the discount-rate creature effects and highlights their disconnect with other natural elements. On top of this, there are random bouts of camera stutter, occasions when the movie looks a bit soft, and shots with skin tone issues. Granted, these examples are few and far between, but they do hold 'The Scorpion King' back from perfection. Even with an abundance of inadvertantly two-dimensional action scenes, 'The Scorpion King's new DTS HD Master Audio 5.1 surround track is a fantastic addition to the disc. It may not offer fans a revolutionary upgrade from the HD DVD's well-received Dolby Digital Plus mix, but it does showcase improved low-end extension, more ambient detailing, and increased fidelity. So why am I giving this DTS HD MA track the same score I previously gave the HD DVD's DD+ mix? Times change. When I reviewed the HD DVD edition nearly two years ago, it was as close to the pinnacle of high-def audio as the current BD track is to other recent DTS HD MA tracks. Of course, a similar score shouldn't suggest that the results are anything less than impressive. LFE output is powerful and aggressive, adding plenty of heavy thooms and hearty thunks into the mix. High-end tones are crisp and clear as well -- dialogue is perfectly prioritized amidst the chaos, transparent pans allow subtle effects to naturally move through the soundfield, and precise directionality allowed me to immerse myself in an otherwise shallow film. More often than not, sound design is limited in the upper and lower ranges because viewers generally don't care about the subtleties of a soundscape. Thankfully, 'The Scorpion King's sound designers seem less concerned with matching the tone of the film than in focusing on the impeccability of the mix. My only significant complaints revolve around a few of the director's schlocky sonic choices (neither of which denote a technical deficiency in the track). To be specific, the film is supported by an obnoxious heavy-rock soundtrack and its sound effects are stagey and melodramatic. Pay attention during the final battle between Mathayus and Memnon -- you'll applaud the sound implosion in the mix when Mathayus draws the arrow out of his back, but shake your head after the arrow strikes its target. What begins as an interesting design choice climaxes with an underwhelming 'ker-chunk' that I could find on a consumer level sampler CD. Even so, this chunky DTS HD MA track will easily satisfy fans looking to wake up the kiddies and rouse the neighbors. The 2006 HD DVD edition of 'The Scorpion King' was released on a combo disc. While the high-def side included a director's audio commentary, owners had to flip to the SD side of the disc to access the film's featurettes, actor commentary, and additional goodies. 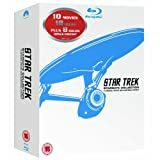 Likewise, this Blu-ray edition includes Russell's commentary as well as a collection of repurposed SD content housed within an interactive U-Control track (detailed in the next section). Director Chuck Russell's mixed-bag audio commentary is engaging one moment and delusional the next. I enjoyed the track every time Russell focused on the his attempts at authenticity, his attention to detail, and the cultural theology he tried to reproduce in 'The Scorpion King.' Less interesting are entire scenes where he narrates what's happening on scren, his boring anecdotes and their "shoulda-been-there" resolutions, unnecessary technical details about camera rigs and dollies, and a seeming inability to recognize the weaknesses of his production. 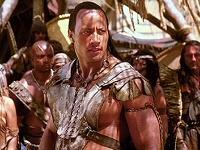 'The Scorpion King' is a leap ahead of 'The Mummy Returns,' but falls short of the first film in the series. Everyone involved clearly had a good time, but The Rock can only hold the film on his shoulders for so long before it starts to crumble. Blu-ray fans who are anxious to see what Universal has in store for them can rest easy. This release features a striking video transfer, a powerful DTS HD Master Audio track, and a PiP U-Control experience. While the film won't appeal to everyone, and the supplemental package isn't up to today's standards, you may want to consider checking this one out.